Pinki is a comics series by Diamond Comics characterizes a five years old girl. 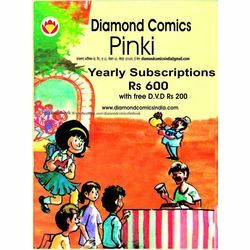 The Character of Pinki was created by Cartoonist Pran Kumar Sharma in year 1978. The comic is distributed in 10 languages. Pinki is often seen with her pet squirrel named Kut-Kut. The other notable characters in this comic are her neighbor Jhaptji, her friends Bhiku and Champu. Whenever she tries to help her neighbor Jhaptji, she always messes everything and whole neighborhood is scared of her menace doings.